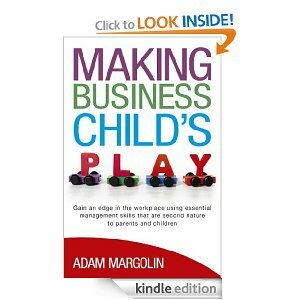 MAKING BUSINESS CHILD’S PLAY BY Adam Margolin was an informative book on how to use basic parent skills in the work place. The author gives examples on raising his son and daughter and uses the lessons he learned to deal with employees. As a parent you will see that alot of these seem to be common sense, but companies are not using the information to make smooth transitions for first time employees. Chapter one was a great starting off point letting companies know that a simple welcome package can help a person have a great first day and a great first impression of the company they work for. The chapters follow the growth of the author as a parent and manager. I enjoyed this book from the acknowledgements to the end. I liked seeing the family photos and as a parent myself I was laughing while reading things his daughter did or said. I feel anyone that is employed would benefit from reading this book. I have already recommended it to family and friends and they are waiting for April 23rd to get a copy. This book was received for the purpose of an honest review. Thank you rae! You are the first person to review my book and I was worried… I am really glad you enjoyed it and would recommend it. Phew!